The Adrenal Glands are small, triangular glands located on top of both kidneys. They are made of two parts: the outer region is called the cortex and the inner region is called the medulla. The function of these small glands is performed by a wide variety of hormones released by these structures and is mostly directed at the physiological response to stress. The medulla is responsible for producing epinephrine and norepinephrine (adrenaline), which control the body’s reaction to stress and affect blood pressure, heart rate and sweating. The adrenal cortex produces hormones such as cortisone and aldosterone which are necessary for fluid and electrolyte (salt) balance in the body as well as regulating the use of dietary protein, fats and carbohydrates and controlling inflammation. The adrenals also take on the role of producing estrogen after the ovaries cease to. It's important to make sure these glands is tuned up and functioning properly before menopause. Major disruption and illness can occur if the adrenal glands do not function properly. Cortisol is a glucocorticoid hormone that plays a vital role in the body. It mobilizes nutrients, regulates the metabolism of proteins, fats and carbohydrates, stimulates the liver to raise blood sugar levels, acts as an anti-inflammatory agent and helps the body respond to stress. When the adrenal glands are not functionining optimally, a person may develop a condition known as adrenal fatigue, or adrenal exhaustion. This often develops after periods of intense or lengthy physical or emotional stress, when over-stimulation of the glands leave them unable to meet the body's needs. Symptoms of hypoglycemia - low blood sugar. Shortness of breath, feels like you can't get a full breath. Feeling rundown most the time. Most energetic in the evenings. Slow to recover from exercise. Increased environmental or food allergies. Cortisol also plays an important role in thyroid function. Namely, it helps cell receptors receive thyroid hormones from the blood to the cells. On the other side of the coin, low cortisol can result in high amounts of thyroid hormones to build in the blood, and not absorb properly. This can cause anxiety or nervousness, light-headedness, shakiness, dizziness, racing heart, sudden weakness, nausea, etc. Low cortisol can also keep you hypothyroid with hypo symptoms. If you are on thyroid medication and your tests now show "normal", yet you continue to have hypothyroid symptoms, it is strongly advised that you get your adrenal function tested. How are adrenal problems diagnosed? Adrenal problems are most commonly diagnosed based on laboratory tests which measure the levels of adrenal hormones (Specifically cortisol) in the blood. 1) Do you have a hard time falling asleep at night? 2) Do you wake up frequently during the night? 3) Do you have a hard time waking up in the morning early, or feeling refreshed? 4) Do bright lights bother you more than they should? 5) Do you startle easily due to noise? 6) When standing from sitting or from lying down, do you feel lightheaded or dizzy? 7) Do you take things too seriously, and are easily defensive? 8) Do you feel you don’t cope well with certain people or events in your life? If you answered yes to some or all of the above you may want to try the flollowing. You can determine adrenal condition (and thyroid function) by charting your temperature several times daily - a technique pioneered by Dr. Rind. Take your temp 3 times a day, starting three hours after you wake up, and every three hours after that, to equal three readings. Then average them for that day. Do this for AT LEAST 5 days. If your averaged temp is fluctuating from day to day more than .2, you very likely need adrenal support. If it is fluctuating and overall low, you may need more adrenal support and thyroid. If it is fluctuating but averaging 98.6, you may just need adrenal support. By far, the most accurate way to access your adrenal function is to use the 24 hour saliva testing method which tests your cortisol levels at four different times of day and allows you to view your daily cyclic adrenal function. Holistic and natural remedies can be highly effective when used in combination with other treatments. These remedies manage to address the symptoms of the adrenal gland health disorder as well as the individual’s overall health and well being. Herbal and homeopathic remedies are gentle, yet effective without the harmful side effects of conventional medicine. A combination of herbs such as Borago officinalis (Borage), Eleutherococcus senticosis (Siberian Ginseng) and Astragalus membranaceous (Huang Qi) can be used to support the functioning of the adrenal glands and help to assist the body to fight the stress of modern day living. Consult a homeopath or naturopath for a remedy specific to your needs. Certain herbal ingredients such as licorice are well-known for their tonic effect on the adrenal glands and improving ability to cope with stress. Relaxation methods and reducing stress in ones daily life, as well as eating a healthy, balanced diet and exercising regularly can all be of great benefit to adrenal disorders. Borage is an herb with a variety of uses, including significant benefits on the health of the adrenal glands. Eleuthro acts as an overall systemic supporter. It can combat stress and is a supportive tonic for healthy adrenal function. Ashwaganda be a a can be a great modulator for adrenal function. 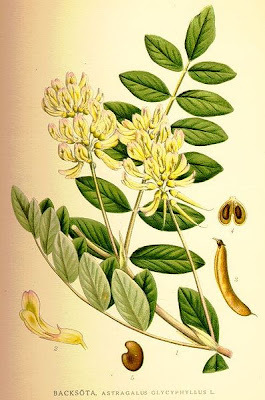 Astragalus has been used in traditional Chinese medicine for many centuries as a natural rejuvenating tonic. Astragalus improves adrenal gland function and aids in stress reduction. It seems that some people respond beautifully to adrenal formulas which can help stave off a downhill slide in the hormonal cascade. Others will need to investigate physiological doses of bioidentical cortisol. Annica, THANK YOU!! I was diagnosed as having adrenal fatigue last year. We'd had to deal with some family issues (as in Dr. Phil and Alfred Hitchcock produce a Waltons/Law and Order crossover). Those are resolved now. The gift was that I FINALLY was diagnosed via spit test with thyroid and adrenal problems that have plagued me since childhood, impacting my weight and making me look as if I had ADHD. So, now we get on with the healing. Many blessings! Your comment made me laugh! (as in Dr. Phil and Alfred Hitchcock produce a Waltons/Law and Order crossover). :)Though i'm sure it wasn't funny wading your way through all of that! It's nice to see that you have a sense of humor! I have struggled also with both adrenal fatigue and thyroid (Hashi's) and I do understand the frustration involved in getting better. Took me ages to finally get the saliva testing done. Astragalus is my friend in the winter! And iodine helps me so much with thyroid. What do you find most helpful so far? The things that I've found helpful are eating a low glycemic whole foods diet, an antioxident supplement, limiting wheat, limiting coffee to one cup a day (crawls into corner and goes into fetal position:) ), and keeping my hormones in balance (ah, the gifts of midlife) with the help of my naturopath. She does spit testing every 6-12 months and we make adjustments as needed. (I respect and understand that a lot of people have issues with bioidentical hormones,and why, but I was at the point where the depression and mood swings were incapacitating.) I took prescription cortisol last year-didn't do much. I'd not thought of astralagus and will see about adding iodine--thanks, Annica! Re-posted - can't spell today! I also understand the hormone balancing plight. One thing I doscovered the hard way was that Vitex - a popular heerb for balancing female hormones also LOWERS cortisol - in my case quite drastically. Since brain fog was a major symptom for me it took ages to figure out! Astragalus has been so nourishing for my adrenals. I love the Native Remedies Adrenal formula. Also, I used ACE drops during initial adrenal crisis - very helpful! It's amazing how many people say that avoiding wheat has helped with thyroid - clearly a big connection there, eh? Thanks for stopping by Fran!